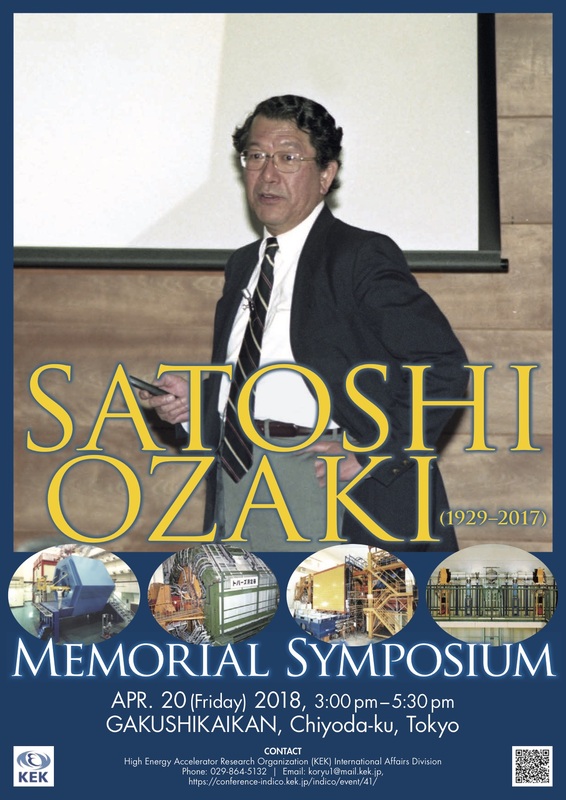 The memorial symposium in honor of Dr. Satoshi Ozaki, who passed away on July 22, 2017, will be held on April 20, 2018 at Gakushi-Kaikan, Tokyo. Dr. Ozaki has been recognized for his outstanding contribution to the promotion of particle and nuclear physics in both Japan and the United States. He directed the construction of TRISTAN, the first major high-energy particle collider in Japan, and the Relativistic Heavy Ion Collider (RHIC) at Brookhaven National Laboratory. He also made significant contributions to the deepening of the mutual understanding and friendship between the two nations through “the U.S. - Japan Science and Technology Cooperation Program”. We would appreciate it if you could attend the symposium and share with us memories of him. Those who will participate in the event are requested to register on the website before March 27, 2018. The registration for the symposium is free. We accept 7,000 JPY for the party.